These tights are simply the fastest tights in Europe! 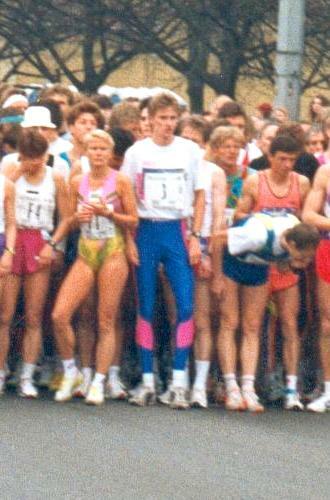 April 1993 I participated in the annual half marathon in Berlin, Germany, and this picture shows the starting line just before the start. Remarkably, each and every one is wearing shorts, apart from just one, 23 years old Carsten Eich from Leipzig. Carsten is wearing a nice pair of royal blue tights with a wide pink stripe down the legs. These tights may surely be Carsten's lucky tights, for just over one hour later these tights had carried Carsten through the half marathon in a time of 1:00:34, being the fastest half marathon time by then in Europe. Congratulations, Carsten!